In the realm of fantasy, wizards and warlocks are the formidable wizened, magic-wielding, spell-casting characters capable of turning the tides of battle, healing the sick and wounded and perhaps cooking up a vial of love potion or two. Before we throw in the likes of Chris Angel or David Blaine into the mix, let’s go ahead and find out if there are distinctions between a wizard and a warlock. A wizard is defined as a male magician, sorcerer, mage or warlock whose magical powers are supernatural or derived from the occult. Magic users are called by different names and titles depending on the fantasy world they inhabit. This is the reason these titles are used interchangeably. These characters are commonly found in fantasy literature, fiction, folk stories, legends, mythology and role-playing games. The female counterparts of wizards are usually called wizardresses, sorceresses, witches or wiccans. Wizards are portrayed playing various roles – from wise, long-bearded advisors in pointy hats, to evil magicians who cast spells that can level a mountain. Merlin is perhaps one of the most recognized wizards and predates all others depicted in modern fantasy works. The pointy hat, wooden staff, and long, flowing robes are believed to have been derived from this legendary wizard from Arthurian stories. In film, Albus Dumbledore is the head of Hogwarts and Harry Potter’s mentor. The Lord of the Rings trilogy features the evil sorcerer Saruman plotting with Sauron to rule Middle-earth. There’s also the common character of the goofy, absent-minded yet powerful wizard prone to mistakes and casting the wrong spells. A wizard’s power may come from various sources, which are often limited by certain factors such as the presence (or lack) of mana and frequency limits on spellcasting. They learn spells by studying mysterious grimoires, or ancient tomes. It is also common for a magic wielder to be in possession of magical items such as gemstones and runes. The Red Witch Melisandre in Game of Thrones required ritualistic blood sacrifice to perform spells. Some continue training in order to acquire newer spells, like Marvel’s Dr. Strange. Dr. Doom’s quest for more magical powers drove him to acquire even more after mastering magic. The term warlock is believed to have come from the Old English word “w?rloga,” which means oath breaker. Some Wiccan practitioners hold that Scottish men who practiced witchcraft in medieval Christian communities “broke their oaths” to the Church, hence the term may have been first used to refer to a male witch. Some believe it is rooted in the Old Norse term “varð-lokkur,” which means “caller of spirits” who can cast evil entities away. The fantasy genre would often depict a magic-wielding warlock being no different from a wizard, as both usually possess the same magical powers and spell-casting abilities. However, in instances where a distinction between classes are required, warlocks are depicted as darker, more corruptible counterparts of wizards. In the popular MMORPG World of Warcraft, warlocks perform the dark arts and can cast destructive spells. Warlocks in the role-playing game Advanced Dungeon and Dragons create forbidden pacts with otherworldly creatures to perform powerful magic spells. So what’s the difference between a wizard and a warlock? Both terms refer to well-known figures in the fantasy world encompassing literature, film, fiction, video games and other forms of entertainment. Although both terms have different real-world definitions, they are commonly used interchangeably with other magic users such as magicians, sorcerers, mages or magus. How the terms are used usually depends on the setting of the fantasy world. Thus, a wizard can be a warlock, or any other male practitioner of magic. 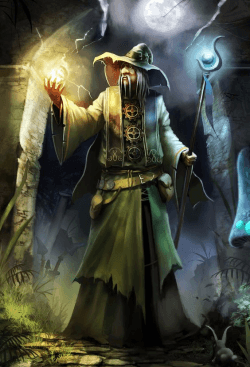 In some instances, the strengths and weaknesses of a magic user are emphasized in order to differentiate one spell caster from the other or to create a character class in video games or role-playing games. In Wiccan lore however, warlocks are considered darker characters who are into practicing forbidden magic. In contrast, wizards are known to be wise and benevolent characters.